According to researchers from the Department of Pediatrics at Peking University Third Hospital, serum procalcitonin levels reach peak levels and decline to normal levels within 96 hours of birth for most infants, including premature infants. However, exact timing of peak levels differs based on gestational age. Procalcitonin is a precursor hormone that eventually aids in calcium homeostasis. Researchers followed 217 infection-free infants for the first 144 hours after birth. Procalcitonin levels were taken at eight timed intervals. The participant pool was made up of 115 term and 102 premature infants. While most infants measured normal procalcitonin levels at 96 hours, peak timing differed between term and premature infants. Term infants reached peak values at 24 hours with a slow decline to normal levels by 96 hours. 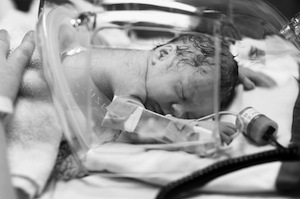 Premature infants did not peak until 36 hours before a slightly faster decline to normal levels by 96 hours. Infants born prior to the 32nd week of gestation did not peak within the first 36 hours after birth. Source: Liu YF, Tong XM, Zheng FY, Piao MH, Ning YZ. Physiological changes in serum procalcitonin concentrations in premature infants early after birth. Zhongguo Dang Dai Er Ke Za Zhi. 2013 Feb;15(2):81-4.